The stock market is a platform where stocks of companies are sold or purchased by traders at a certain price. When buyers are more, the market is known as bullish, and when sellers are more, it is known as a bearish market. The stock market is a platform where stocks of companies are sold or purchased by traders at a certain price. When buyers are more, the market is known as bullish, and when sellers are more, it is known as a bearish market. There is no perfect set of rules you can follow to become successful and make big money in shares market. However, certain strategies can be developed to ensure healthy growth of your portfolio as a trader. 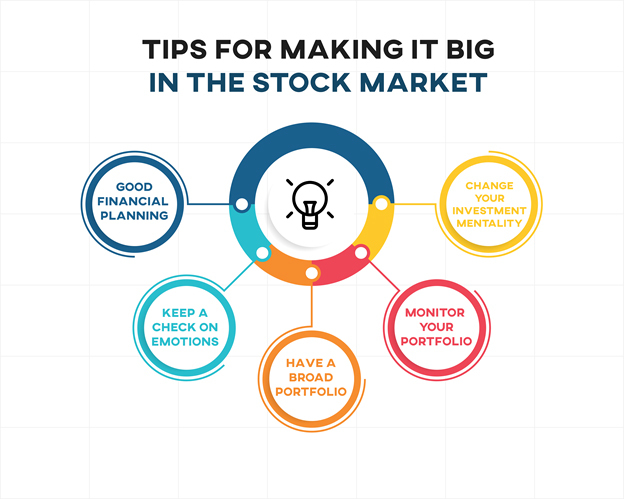 Before entering the stock market make sure that your financial health is good. Keep some money aside from your savings, that you can afford to lose. Avoid using money which is borrowed from relatives, friends or taken as loan from banks. If you are considering long-term investment, make sure that you have enough provisions for emergency and short-term needs as it requires long-term commitments. Traders invest in the stocks of the company without knowing the business of the company. It leads to failure in the long run. Try to invest in the business and not just stocks of the company. The more you know about the business of the company, better is your chance of making big out of it. Determine whether the stock of the company is valued at the correct price or not by considering the past performance of the company. Prefer investing in the stock of companies which are making profit year on year. Greed and fear are two principal enemies of the traders. Favorably, we should buy stocks when the price is low and sell stocks when the price is high. However, emotional investors end up doing exactly the opposite. They make their decisions out of greed of making more money and fear of losing it. Patience can help traders to hold their position for longer durations and prevent them from missing out on potential profits. Investing money in different business sectors is a good investment option. You can invest in pharmaceutical companies, real estate, retail sector, energy and technological corporates. This type of investment strategy will prevent you from completely losing your money due to unexpected uncertainty in a particular sector of business. For example, if the shares of real estate companies are declining due to certain government policies like demonetization then traders can gain from the rise in stock price of pharmaceutical companies, which may be due to discovery in the field of medicine. To prevent making frequent mistakes, it is important for traders to monitor their portfolio. It will give them insights about their performance and how they can improve it. It will help them to make informed decisions and guide them towards high return investments. It will lead to increase in the value of the trader. A person need not be a ‘numbers person’ for making big in the stock market. All he needs to do is brush up the basics and manage himself better especially in the time of crisis to achieve success.